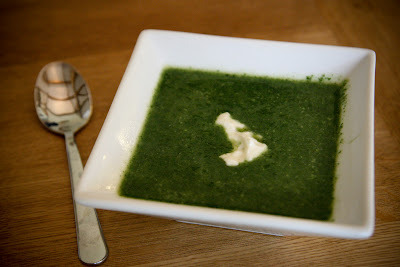 Nettle soup is a lovely emerald green colour with a unique flavour. We always like to keep the nettle soup a surprise and ask people to guess what it is made from. Everyone always loves it, but can’t pin down its humble origins. Nettles are best when very tender, so pick in the spring when the nettles are just coming up or later in the season. Pick the young leaves from the tips. Use rubber gloves or pinch the leaves hard so you don’t get stung. crème fraîche or soya crème. In a large saucepan, sauté the onion in the olive oil until soft. Add the garlic and the cubed potato and quickly stir-fry. Mix the bouillon powder with the boiling water and add to the onion and potato. Simmer until the potato is just cooked, about 10 minutes. Add the nettles, cover and simmer for 5 minutes until the nettles are cooked, but are still a vibrant green colour. Leave to cool a little and then liquidise to a smooth consistency (we use our Froothie Optimum 9200 Power Blender). Check for seasoning and the lemon juice, salt and lots of freshly ground black pepper. Serve hot with a garnish of crushed pink peppercorns and a swirl of crème fraîche or soya crème. Nettles are mildly laxative, an excellent blood purifier and one of the best anti-scorbutics. (anti scurvy) Traditionally eaten in early spring as it is one of the first edible green shoots to appear. Pink peppercorns are not actually peppercorns but are the aromatic dried red berries of a tree Schinus Molle. They have a brittle outer shell enclosing a small pepper like seed.